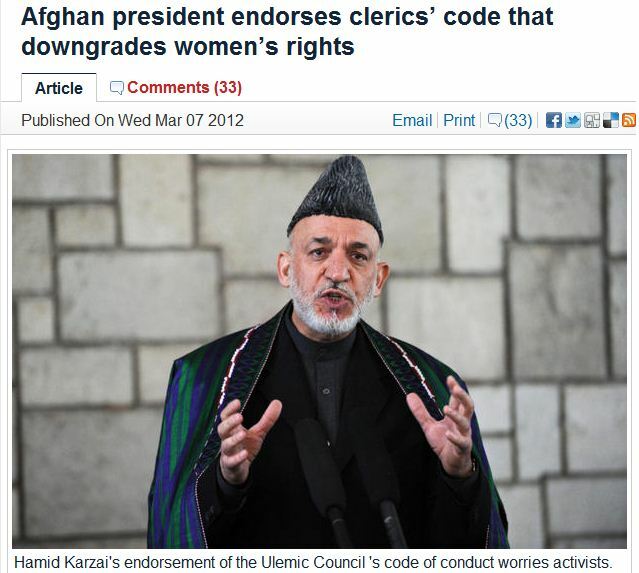 AFGHANISTAN’S KARZAI WELCOMES WOMEN BEING 2ND CLASS CITIZENS……. – The Tundra Tabloids……. 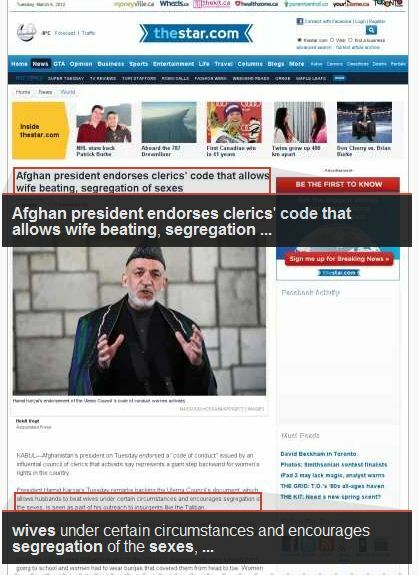 AFGHANISTAN’S KARZAI WELCOMES WOMEN BEING 2ND CLASS CITIZENS……. UPDATE: Vlad spots the following subtle changes by the Toronto Star in the headline of the article, it used to read: “allows wife beating“……. On the eve of International Women’s Day, President Hamid Karzai has given Afghan women an unwelcome present: the message that they are second-class citizens. In remarks made Tuesday, Karzai backed a “code of conduct” written by the Ulema Council of 150 leading Muslim clerics. It could dramatically restrict women’s daily lives and threaten a return to the dark days of Taliban rule. “Men are fundamental and women are secondary,” the council said in its statement released last week, and later published on Karzai’s own website. The move appears aimed at enticing the Taliban into the peace process — but also gives pause to Canada and other countries that have supported efforts to advance women’s rights in the land they fought to take back from the extremists. Since 2002, 158 Canadian soldiers have died in Afghanistan. Previous Post Previous Post MICHAEL COREN INTERVIEWS DANIEL PIPES……. Next Post Next Post EURO ELITES DANGLE TOP EUROGROUP SPOT FOR FINNISH PM…….